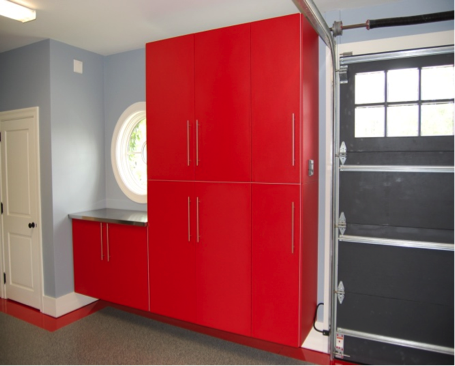 We love garage storage and for so many reasons! We also love, love to be organized - it gives me a huge sigh of relief when everything has its own place and the space is organized - ”aaaaahhhhh” I quietly think to myself. Now I can think clearly again as my mind is not wandering and wondering where my “stuff” is. I am not questioning where my tennis racket is when I’m running late for tennis practice. I know it is neatly stored in the “sporting” basket. When I need that Phillips head screwdriver for less than a minutes use, it no longer takes me a half hour to find it. I know exactly which rack it is on OR with a quick glance across the garage – I can visually see it, neatly and nicely stored in the tool rack. A cluttered space does make for a cluttered mind- garage cabinets offer a perfect solution to help eliminate this awful mind set. They allow for items to be neatly stored and out of site! 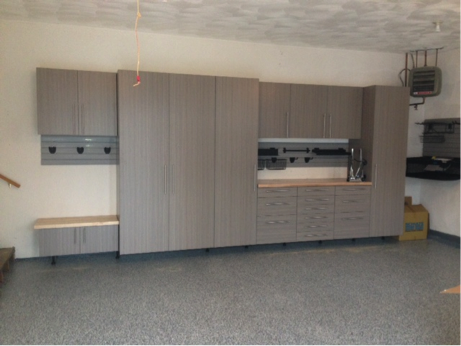 As an added bonus for those of you who have an eye for design, as I do, the cabinets come in a variety of color options. They are commercial grade quality with 1 inch decks and shelves eliminating the need for worry about delamination and sagging. Throw that stuff on those shelves, get it out of site! The garage is often overlooked, forgotten about and underutilized. This is unfortunate as it has tons of potential. It is a space of the home that is not often travelled. We tend to park the car or hang up our rake and run in the house. More reason to make it purposeful for storage for items not used on a daily basis (besides the car). Go vertical! – Overhead bins stored in an overhead rack make a great use of space for storage, especially for seasonal items. There are a ton of storage accessories; cabinets, several types of wall hooks, racks, trays, bars, bins and baskets. 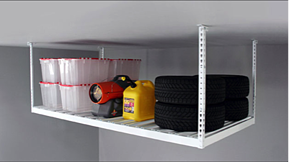 We even install pulley systems so that you can store items at the ceiling height but easily access them as needed. There are tons of storage options and ideas. We have design consultants that can measure your space and offer you a free estimate that will best suite your personal needs and style. Get organized today, spend time on what matters most!